I don’t even know what to title this week’s wrap up. Everything seems so colored by the multiple sad events in the world last week, particularly in Orlando. In my rational mind, I know that horrible things happen in the world every day, every hour even. Somehow, violation of such safe spaces has rattled me. I can’t wrap my mind around the horror of what happened at Pulse, but voices stronger than mine have spoken to that and should be allowed to speak to that. 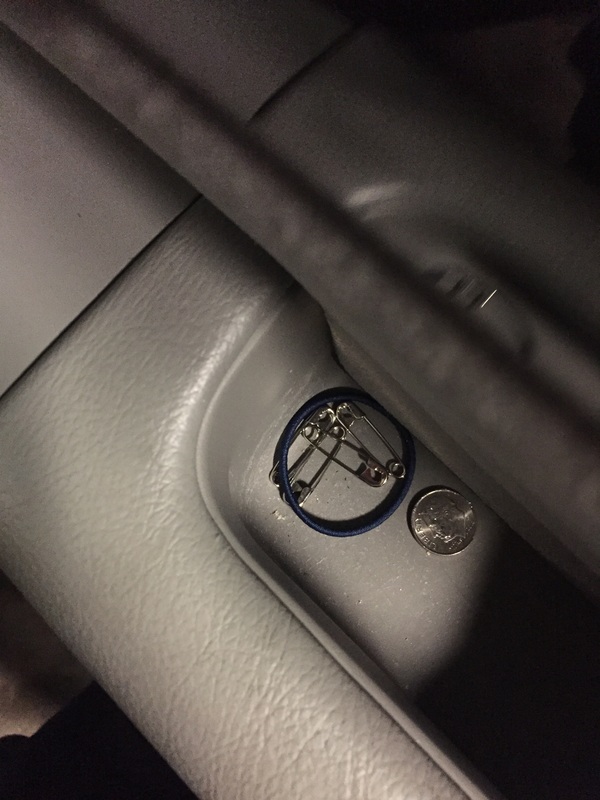 The little boy at Disneyworld was particularly close to home for us. We’ve been on that beach. We stay at the Polynesian, which is along that body of water. It is our family’s happy place and now it feels violated. Even more so, I live in Elkhorn. I run in the neighborhood where that poor family lives. This feels doubly close to home and my heart just aches for that poor family. No matter the circumstances, to lose your child is horrifying to contemplate. I confess, I’ve felt uneasy all week and was even nervous at lunch on Saturday with Oliver playing at the mall a mere 10 feet away from me. Somehow the fact that we were in public made me feel unsafe with him out of arms reach. I’ve always known the world is an unpredictable and dangerous place, on an intellectual level, but this week has brought that to home on an emotional level that has had me feeling nauseous and achy and ill at ease all week. As much as my thoughts and prayers are with all of those directly effected this week by these events and by others that didn’t even register on our collective national radars, I even more fervently hope that we can move beyond hopes and prayers to make these events less likely. I did get some workouts in, I promise, although they were mostly walks in deference to the heat. I did a couple of hilly miles Tuesday and Thursday mornings that were mostly walking. 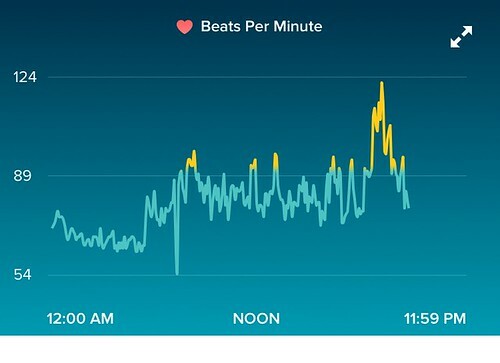 On Wednesday, my FitBit gave me credit for 40+ minutes of activity based on the amount of hand motions I did and my elevated heart rate, but that was actually during a Q&A session I was doing for students so it wasn’t really exercise. I’m just a really energetic speaker. 🙂 That was definitely my good deed for the week. I stand in the center of a group of 75 college students and answer pretty much anything and everything about my job, which gets really interesting. One girl asked about work-life balance and approached me after my talk to explain that she was interested in my job, but also really wanted a family and was thinking that she couldn’t possibly have both. That made me (and my husband) incredibly sad, to think that you’d think you have to choose. That may be true for a select few jobs, but we naively think that if you work at it as a couple, you can make anything work. I really did get a little revved up during that talk! Over the weekend, I did at least get in more official workouts. I ran 5 incredibly hot and sweaty miles Saturday morning. They were the most depressing miles I’d had in ages and not because of the weather or my pace (abysmally slow thanks to the heat). 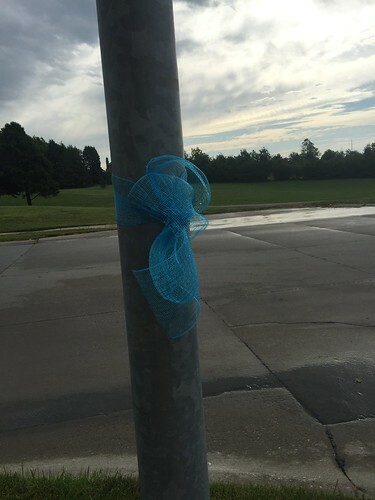 Our neighborhood is full of blue ribbons to show support for the little boy killed at Disneyworld and every time I think of him, my heart shudders a bit. That, coupled with the bizarrely large number of nests and baby birds blown out trees and killed in a bad storm we had Friday night made for a run with entirely too many reminders of death. After that, I went for a hilly 4 mile walk before we started Father’s Day festivities of taking Darrell out to lunch at his favorite taco place and then dinner at hibachi. 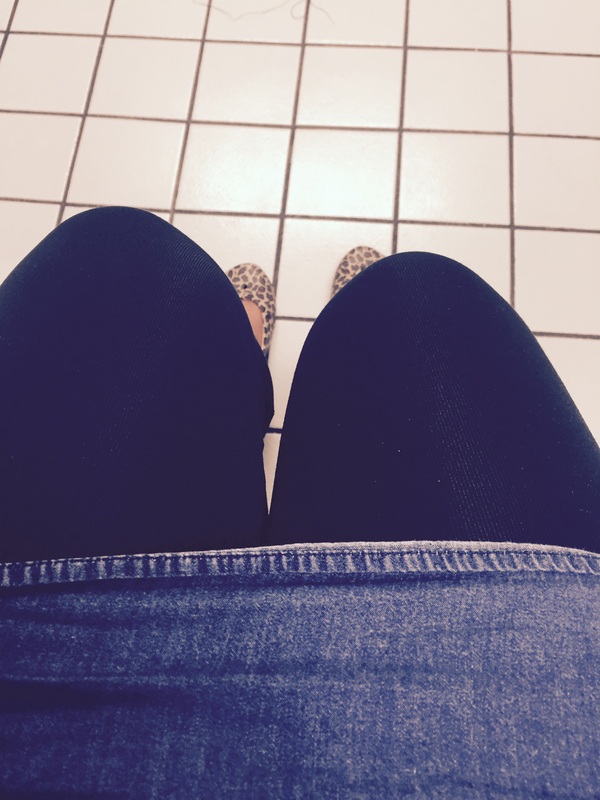 My NSV this week is that I wore a too-short dress but instead of feeling self conscious, I found myself frequently admiring my own legs. 🙂 My other NSV? All of this sadness had me contemplating chucking this whole tracking and eating right thing just to drown my sorrows in cookies but I resisted. Little victories can be big. I’m grateful this week for every moment I get to hold my family safe this week and every week. I hope for the same for you! 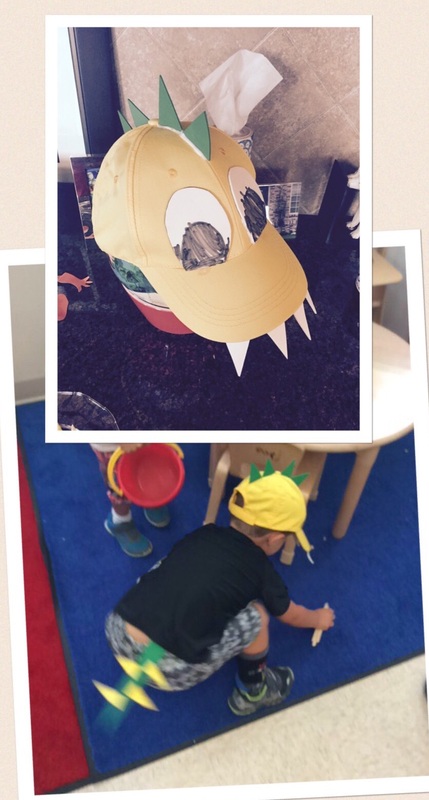 Thanks as always to Tricia and Holly for hosting our link up! I’m hoping that reading everyone else’s wrap ups this week will get me motivated to get more on board with my summer exercise plan so I’m ready for that hike of Pulpit Rock I have coming later this summer and for marathon training in August! I have a 10K coming up this Saturday and a 5K on Sunday, so at least I know I’ll get some miles done this week. Fingers crossed that the weather cools a bit by the weekend! I have a really bad habit of letting tapering go too far and not running at all once I finish my last “real” training run. This is not something I’d advise! Tapering means cutting back, not cutting out, your running. Oops! I think I’ve only done this well in one or two training cycles, where I kept up the runs as scheduled during taper time. This week was not one of those weeks. Between the travel at the beginning of the week, finishing up my research meeting in Baltimore, and then the crazy catch up from traveling once I got back to Omaha, I got lots of steps this week but only one run. 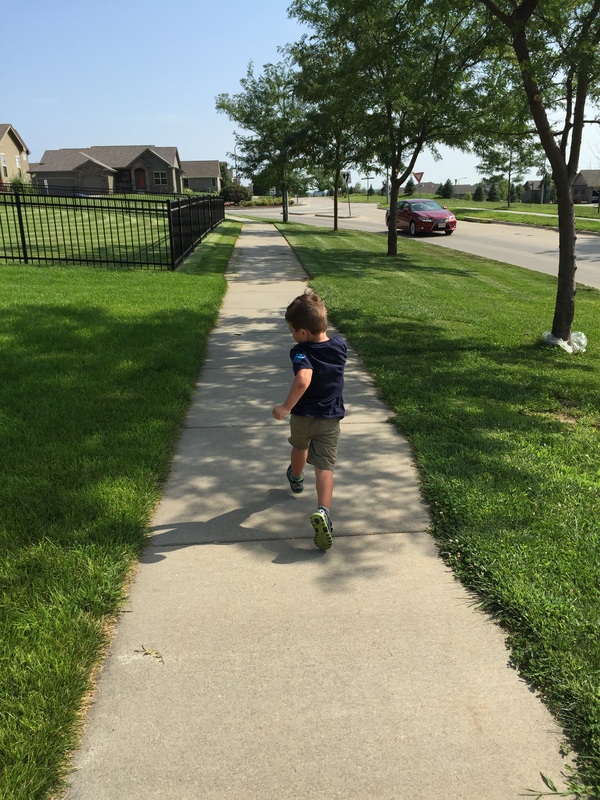 On the bright side, I did lots of walking this week and got a fun workout in Saturday when I ran around with Oliver before tee ball practice. We raced and played tag and red light-green light, having an all around good time. It’s interesting watching him play tee ball because he wants so badly to be good at it and like his perfectionist Mama, tries to avoid the parts he isn’t naturally as good at like hitting and catching. He’d run bases and throw all day if we let him. 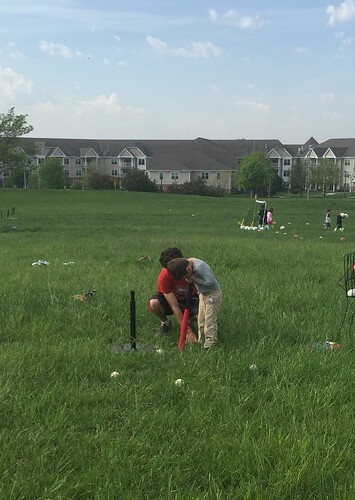 His coach is doing a nice job working with him on the techniques that will help with the batting and he’s made leaps and bounds with catching. It’s so amazing to watch little bodies develop. I told him that I had to practice with the things I did too, like running in order to get better at it. I did finally get to practice that running thing again on Sunday, my one run of the week, in a 6 mile Mother’s Day gift to myself. 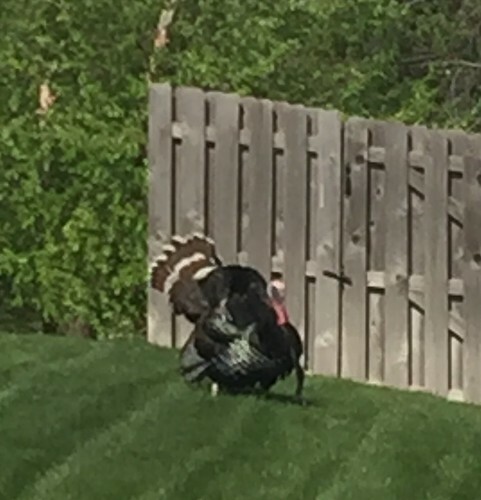 Gotta love spring in Omaha – this guy gobbled at me the whole time I was going down the street! I got a nice 6 miles in before we headed out to brunch and more walking at the botanical gardens here in town. 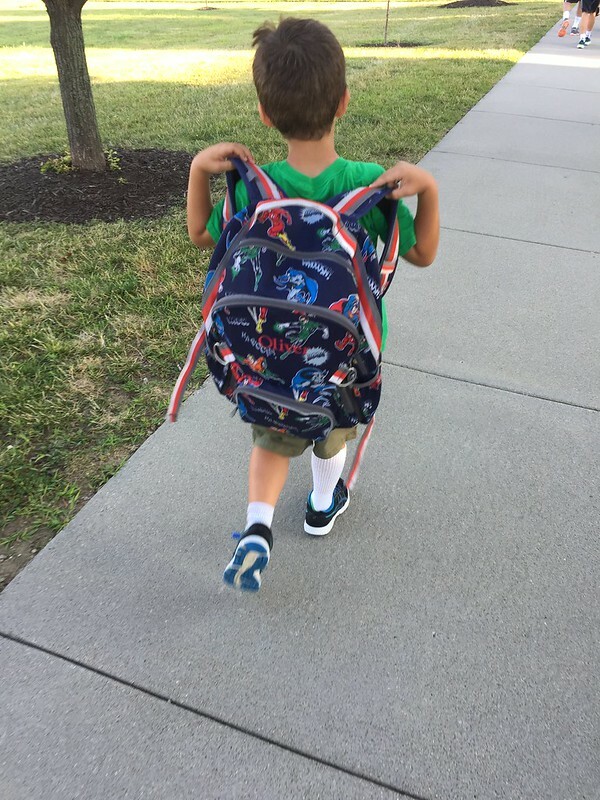 I love that we can be so active as a family now – very different from the old days when weekends were spent watching TV and playing video games. 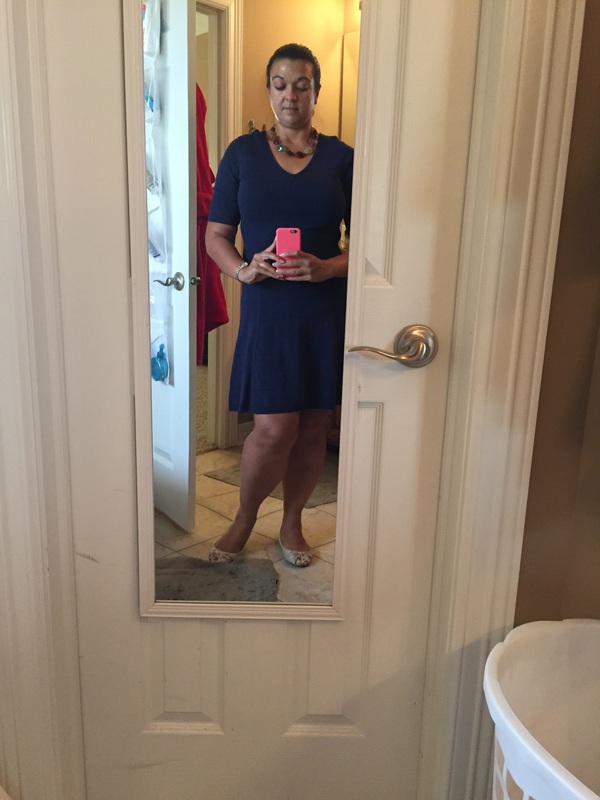 Definitely a huge NSV! I will say that all of those hills at the botanical garden after a 6 mile run left me with sore legs today, in that pleasantly “used” sense. I will be sure that this week includes some dedicated rolling and yoga time to be sure things are loose for Sunday’s half marathon. My goals for this half marathon are just to finish with a smile and feeling good. This race was primarily a motivation to keep me moving this spring and it served that purpose admirably! Who knows how long I would have let the winter weather to keep me indoors if I didn’t have something to train for. 🙂 Right now, the weather looks pretty nice for a half marathon on Sunday but we’re still too far out to take much comfort in that. Fingers crossed it isn’t too hot! May can be very unpredictable. I did a good deed last week that made me smile, because it was in recognition and thanks of an even bigger good deed that someone else I know is doing. To keep it a surprise, I can’t say more, but I will say it truly amazing to me how much love people find in themselves to give to those in need. People can be amazing. 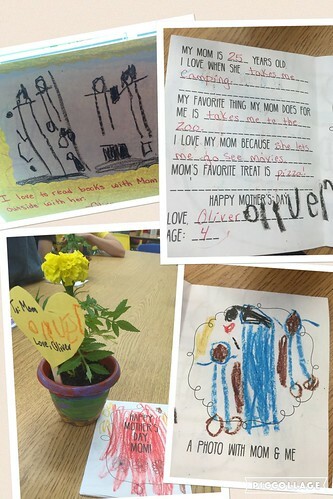 Today I am grateful for the chance that I get to be Oliver’s mom. He’s an amazing little soul and I’m glad I was chosen to help guide him through life. I’m also grateful he thinks I’m 25 on our little Mother’s Day cards. His buddy James thought his mom was 62. This week, I’ll run a couple of times to keep loose, stretch out with some yoga and foam rolling and enjoy the fact that I get to go run 13.1 miles for the fun of it this weekend. It’s a good life. 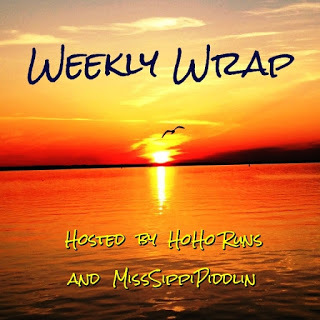 I’m linking up with Holly and Tricia for the Weekly Wrap Up and looking forward to reading about everyone else’s weeks as spring racing season winds down. Any big plans this week for you guys? 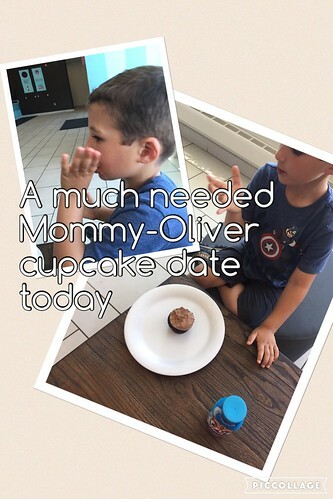 We’ve talked before about how big a motivation Oliver is for me in adopting a healthy lifestyle. Darrell and I both want Oliver to grow up with a healthier diet than the southern fried food we grew up with, but I also want to avoid introducing the kind of food and body image issues I struggle with. 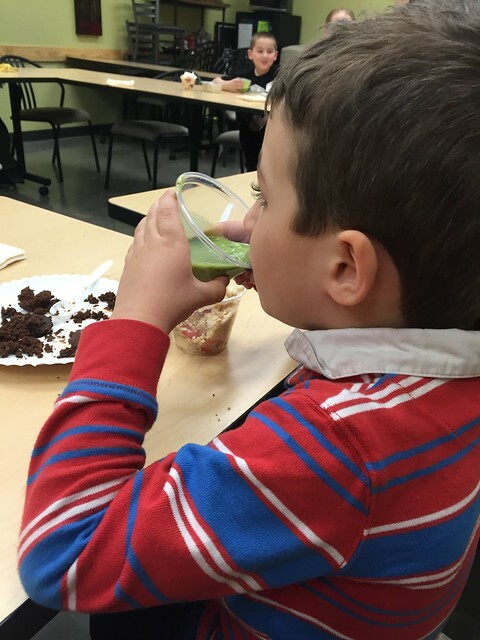 Oliver and I went to a cooking class together on Monday where someone thought it was a wise idea to give a bunch of kids FOUR desserts at 4 o’clock in the afternoon. 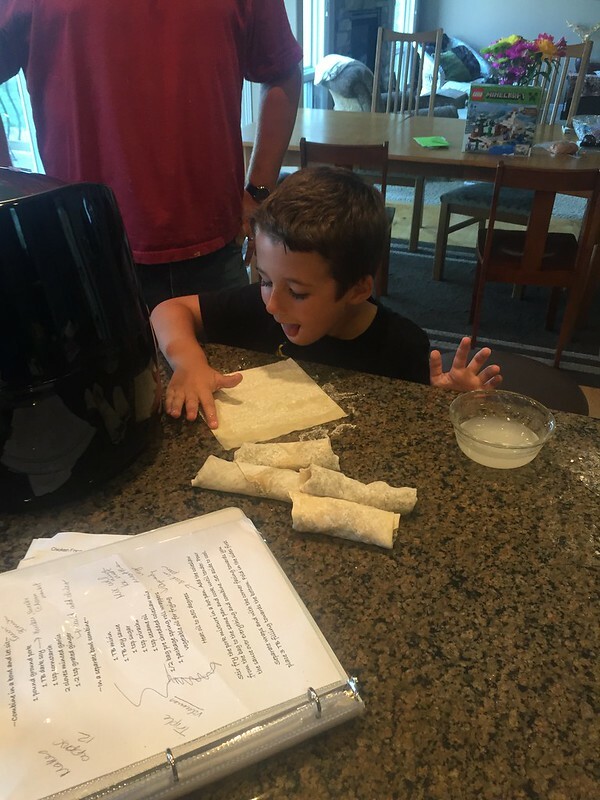 We had a ton of fun cooking and what struck me most watching Oliver was how well he self-regulated his food intake. Instead of eating all 4 desserts just because they were there, Oliver took tastes of things but didn’t feel the need to finish them. Who doesn’t finish chocolate cake ?! A kid who knows that just a taste is as good as inhaling the whole thing, that’s who. It amazes me that my kid has a healthier relationship with food than I do right now. 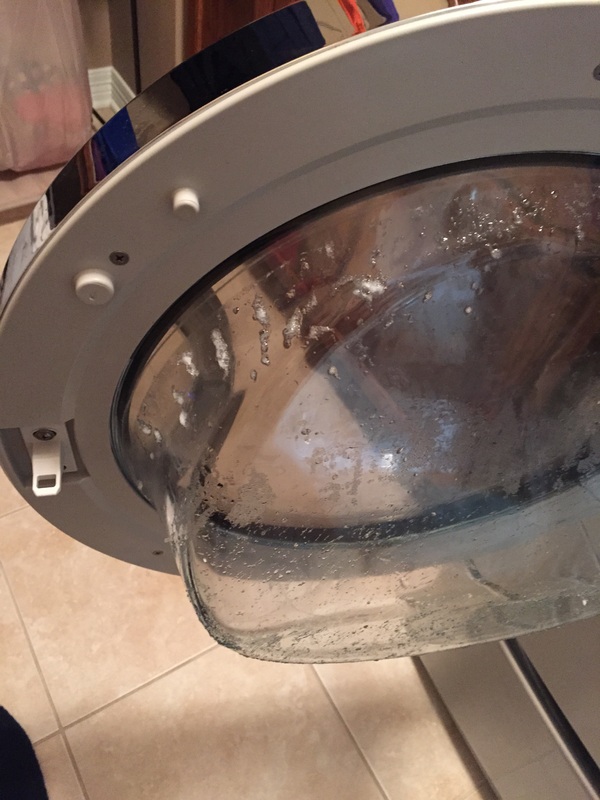 Now I’ve just got to be careful not to screw it up! So how are we going to keep that healthy mindset? – We involve him in picking out the food we eat and in preparing it. He’s always more likely to eat a new food if he’s had a hand in what shows up on the table. 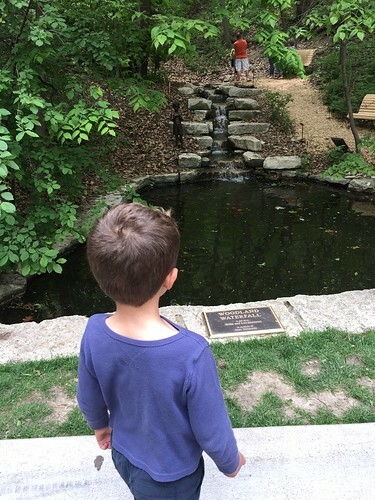 – We have a garden and let him actually participate in knowing where the food actually comes from, in addition to visiting the farmer’s market and talking to real farmers. Our city mouse is fairly sheltered about the real world, but this at least gives him a little glimpse. We’ve been afraid to tread too far into the whole idea of where his beloved turkey comes from, but veggies we can talk about freely. – We talk about food in terms of the good things it does for us, in terms of giving us energy and building our muscles. He was the only kid in pre-kindergarten who talked about calcium in the milk back when he broke his leg. – We don’t talk about foods making us fat. I am distressed at how hard this one is. Why should that be my automatic answer to why we don’t have dessert every night? We don’t have dessert every night so we can save room for foods that build healthy bodies. That should be the answer to myself, just like it is to him, not we don’t have dessert every day because it would make us fat. – We let him self-regulate how much he eats. This is so hard for me as a mom, letting him decide how much is enough. However, developmentally kids are good at regulating amounts of food they eat when they’re young. At some point in childhood, we teach them to ignore those signals. They aren’t as inherently good at regulating the kinds of food they eat, so it’s our job as parents to make sure they get a good variety of nutrients rather than live on chicken nuggets. However, it isn’t our job to make them clean their plates. I have to tell myself that a million a times a week. – We encourage sometimes foods like cake and pie and cookies as sometimes foods, worth enjoying but not worth feeling guilty over. Again, I have to struggle not to project my issues here as well! We try to avoid using food as a reward or emotional balm as much as we can too, although Oliver has called me on it when I screwed this up! Just a week ago, we were talking about things to cheer us up when we had a bad day and when I mentioned cookies, he told me “food is not a friend Mama.” What a wise guy! – We never talk about being fat or gaining weight or anything like that in front of him. I’d love to say I never talk about it when he isn’t around, but I’m just not there yet. I’m getting better. I need to be sure I don’t talk about myself EVER in a way I wouldn’t talk about myself in front of him. 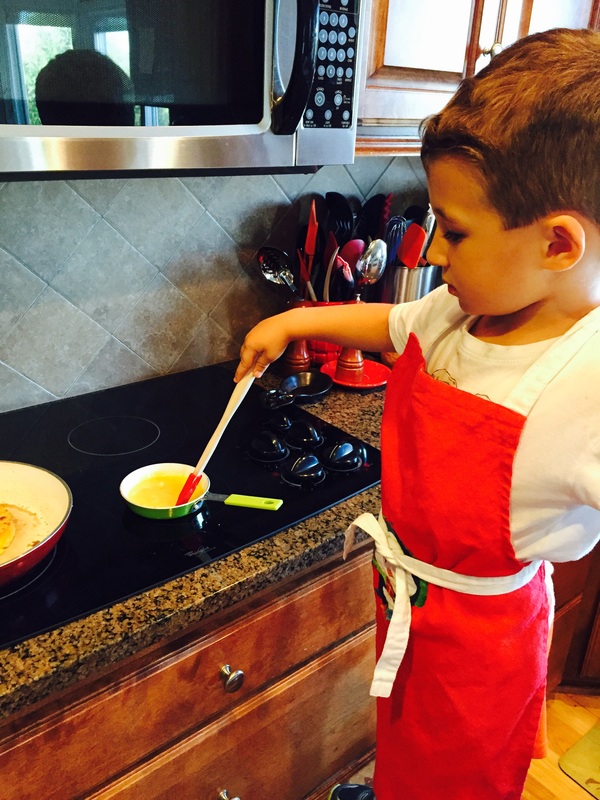 How do you encourage your kids to keep a healthy diet and a healthy relationship with food? I’m dreading the intrusion of the real world once real school starts. Right now, things are fairly controlled in terms of the kind of food school provides (no outside foods at our preschool and limited treats) and what we have at home. With public school and visits with friends, I’m about to lose a lot of control of what he’s exposed to. Fingers crossed that the lessons we’re teaching now will stick a bit! This time next week, we’ll know how the Des Moines half marathon went. 🙂 I’m getting more comfortable with the idea of my modified goals for the race. As my non-runner husband put it, there is no “failing” if you run slower than you expect unless you’re trying to outrun zombies. Wise words. Monday I had a 2 mile run on the schedule, but walked this instead given my knee pain with Sunday’s run. The knee ached a bit, but it was better than it had been Sunday. Tuesday 3 mile walk instead of the scheduled run, with things starting to feel back to normal thankfully! Wednesday Rest day on the plan, but I did a 1 mile walk and some yoga/strength training. Thursday Time to try to run again! I did a half mile warm up on the treadmill, which felt good enough that I went ahead and did my two tempo miles (originally three on the schedule, but I didn’t want to push it since this was my first run this week) without any real pain. The dull ache that I had was the same if I was running or walking, which was a relief I suppose? Friday Cross training on the schedule, which threw me off a bit since this hasn’t been part of this Hanson-esque plan up until taper time. 🙂 I walked 2.5 miles. Saturday I did 1 mile on the treadmill pre-self defense class and 1.5 miles after, for a total of 2.5 miles (2-3 on the plan). My arms and legs were sore after that self-defense class! It was really active. We talked a lot about “disqualifying” yourself as a victim, as much as you can, by being alert and projecting confidence. We also talked a lot about being aware of what weapons you have at your disposal if you are grabbed. We tend to freeze and forget that we might have our voice, our elbows, our knees, a free hand, etc at our disposal. Then we got to hit and kick stuff. A lot. The little kids kept stopping to look in the gym doors at all of the mommies doing things that were against the normal house rules. 🙂 I might like to do a more in depth class one day or even take some martial arts. 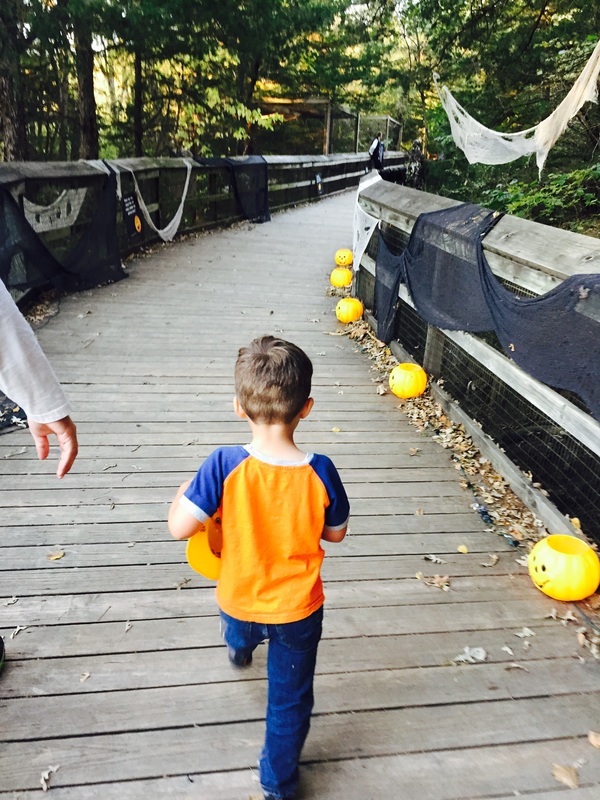 I also got in some extra walking at the Haunted Safari with Oliver, where we got to walk up to see wolves and bears, in addition to playing lots of Halloween games. Sunday I had 6-7 miles on the schedule and did an easy 6 mile run. Like my earlier runs in the week, there was a little ache in my knee but it was the same whether I was running or walking, so I think my plan to do the half marathon but not push the pace too much is a reasonable one. 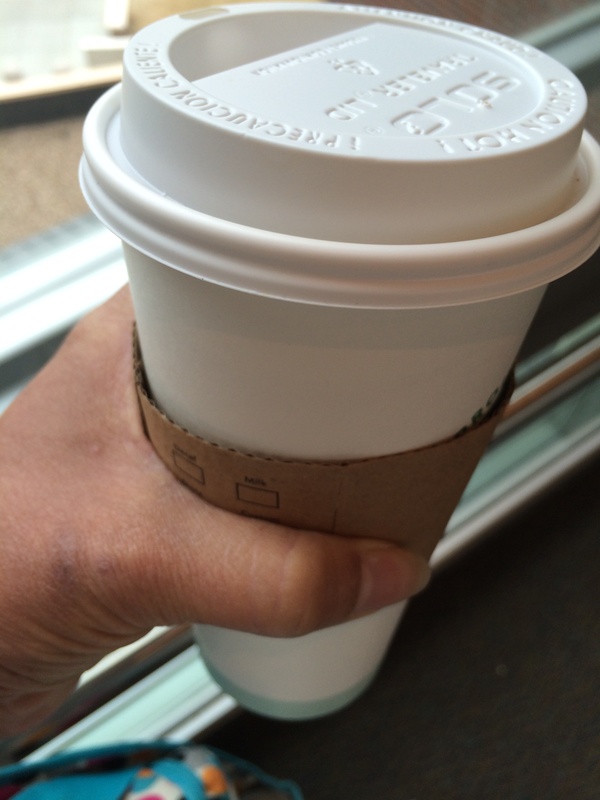 I finished my 6 miles at Starbucks and then walked the 0.6 miles home with my soy latte. 🙂 It was a gorgeous day to run with perfect weather but even more fun was the yoga class I did with Darrell at 11. Sorry, no pics. He’d kill me. I’m proud of him for stepping outside of his comfort zone! It was a nice hour long beginner class and my muscles are feeling it this morning. I always work a little more in structured yoga class environment than I do at home. Absolutely glorious golden fall morning! All in all, it was a good taper week. This week, I have a 2-3 mile run today, 3 miles tomorrow with some speed pick ups and a 3 mile run on Thursday before race day Sunday. 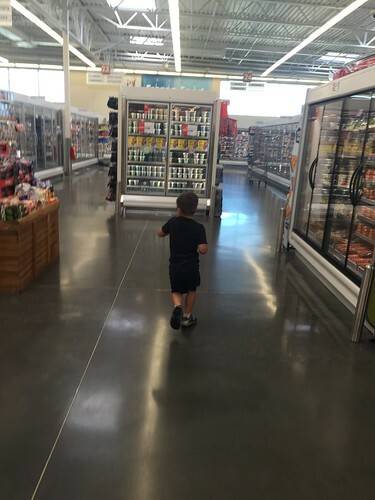 I’ll keep my eye on fueling well in this last run up to the race, which may be difficult because my four-year old is testing his boundaries, which can be a binge-trigger for me. Last night was a difficult parenting night and I’m so grateful that Darrell is a great partner in this endeavor. We are able to back each other up and work with each other and O to help him grow up to be a somewhat functional member of society. 🙂 “Does Captain America wear listening ears?” may have come out of my mouth last night. My NSV is recognizing that I needed to immediately fill the mixer bowl with soapy water so I didn’t eat all of the leftovers of cream cheese frosting I had after making this treat for Darrell’s job during the time of O’s little meltdown. I’ve gotten better at mitigating my triggers, that’s for sure. Confession: In pre-weight loss days, my husband may have caught me eating cream cheese frosting spread onto a chocolate bar in the pantry. Here’s hoping everyone has a great week and gets lots of lovely outside time in the fall weather (or at least gets some fall weather – I know my Texas people are experiencing some high temps!). I could watch the yellow and orange leaves of fall drift through the air for hours, which definitely impairs my productivity this time of year. I’ve had this little corner of the internet for TWO years now. 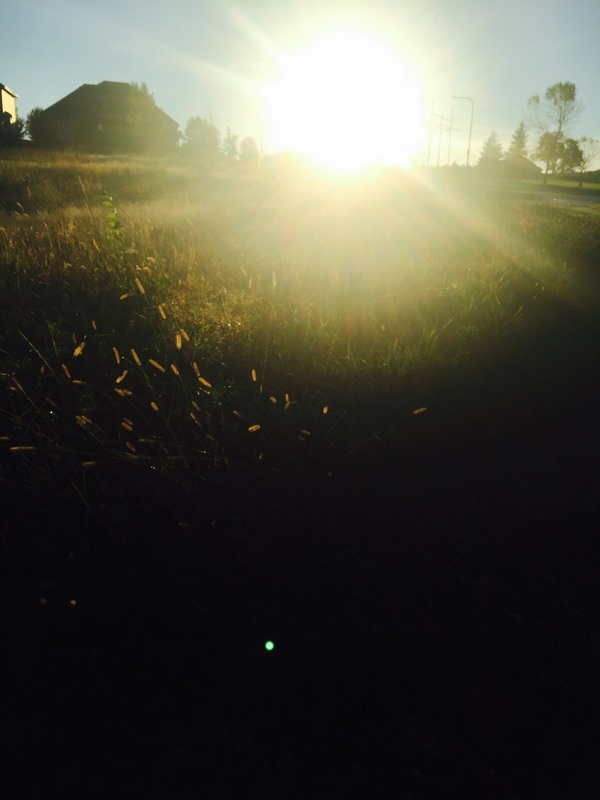 On August 15, 2013, I wrote my very first post (here) talking about myself and why I was starting this blog. I will say that my reasons for the starting this blog remain a big part of why I continue – accountability, creating a record and inspiring others in a small way. Beyond those things, I’ve gained some really lovely friends and I thank you all for your virtual support over the last two years! I thought it would be fun to look back at my most read posts this year and see how that list compares to my personal favorites. Topping the list of “most read” according to WordPress are a handful of RunDisney posts: Working with a travel provider and the Star Wars Half Marathon, Expo and 10K recaps. I certainly love looking at those photos again myself – that trip was a highlight of my year. 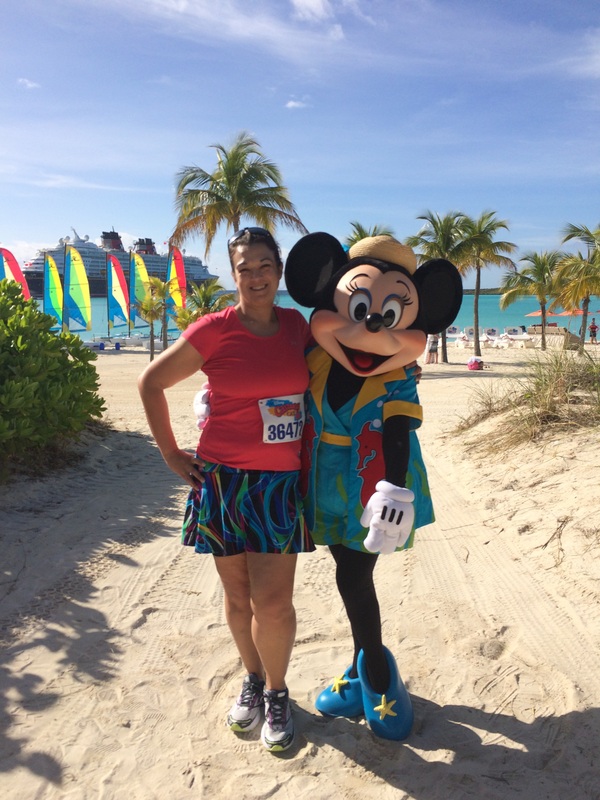 🙂 By far my most read post this year is the Castaway Cay 5K recap (1,132!) which reflects the interest people have in that particular FREE Disney race. I totally recommend it if you’re going on a Disney Cruise. 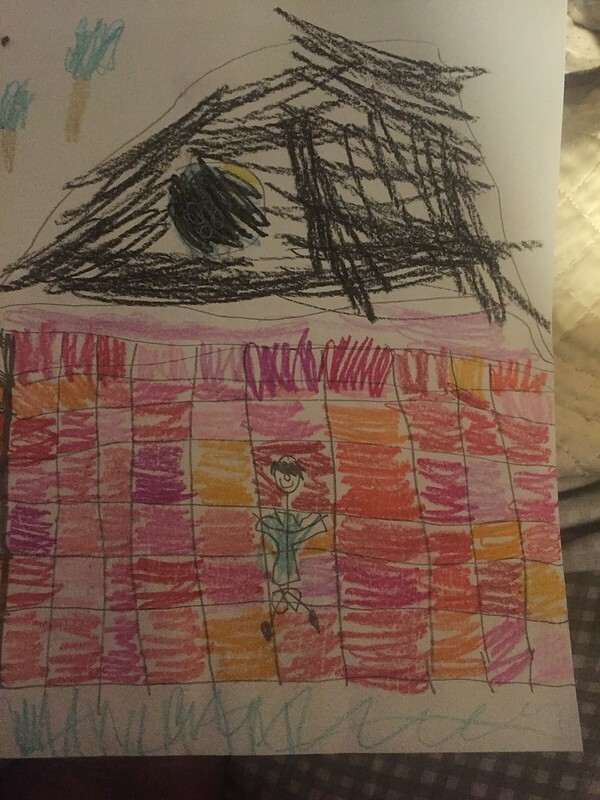 I think my personal favorite post this year, beyond these, was “Running makes mommy happy” because re-reading it still gives me all the feels. Man do I love that kid and I love that we’re back to running together this summer after he’s recovered from his broken leg. 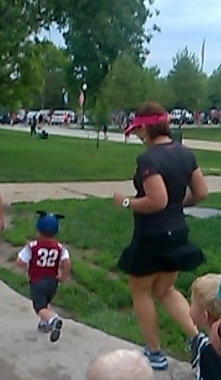 He’s got that Mickey race to train for after all. I’m still kind of amazed that I’ve done this for two years, 659 posts (as of this one), and over 11,000 visitors. Crazy. Thank you all for being my friends, my sounding board and my invisible army that I use to cheer me on when the going gets tough. Thanks for sharing and letting me cheer you on too. 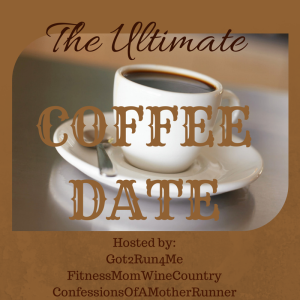 Coffee Date: Steamy August morning! My windows are literally steamed up at my house today. It did not make me look forward to stepping out into the August heat! Thanks as always to Lynda, Coco and Deborah for hosting! One of these days, I should keep track of just how many cups of coffee I drink in a day. Spoiler alert: It’s a lot. It takes a lot of caffeine to get this girl going in the morning. Especially today – I was up too late for a girl’s night showing of Trainwreck (worth seeing Lebron James alone! Interesting!) and wine afterwards. I’m getting old – 11:30 and two glasses of wine are apparently enough to make waking up the next morning a startling experience! It didn’t help that the wake up came as Oliver convinced Darrell to turn on “Sheriff Callie.” Sheriff Callie is cute but not the first thing you want to enter your mind in the morning. Ah well. This morning my coffee is being delivered via the lovely carafe at Village Inn, where Oliver and I are on our usual weekend Mommy-Oliver date (aka the day Daddy gets to sleep in – or go back to sleep in this case). I eat a lot of fruit and veggies, but I still suspect the lovely coffee bean is my largest source of antioxidants during the day. I am totally okay with that. If you were joining Oliver and I for coffee and breakfast this morning (egg white omelet with spinach and tomato, Canadian bacon – of which O will eat half, wheat toast and cottage cheese FYI), we’d definitely have to show you pics of the awesome dinosaur hat and tail we made for Oliver’s dinosaur dress up day at school this week. Yes, I know I showed this pic yesterday, but I’m still super proud of this. I am not a Pinterest-crafty Mom. My skills are limited so the fact that this turned out remotely cute is a huge Mom Gold Star in my week. I’d also pick your brain over my dilemma with regards to the invitation O got to a birthday party next weekend. I have to decide what to do about the RSVP today – we’re already pushing it a little late. Among the many activities at the party will be a bounce house. Thanks to his broken leg, O is barred from bounce houses until the orthopedic docs clear his growth plate later this year. The bounce house is just one of many activities, so there will be other things for him to do, but it’s going to be important to keep him out of it despite all of his little friends hopping in there. Do we let him go? At this age and since we don’t know the parents, at least one of us was going to stay at the party, but it would be easier to keep an eye on him and keep him out of the bounce if we both went. Would that be weird? Or would it be weirder if only one of us went without the other having a good excuse for missing it? Ugh, the social stress of mom socializing! I confess I sort of sighed when this showed up in O’s school backpack, lovely as the birthday boy is. As I could watch this Agents of Shield-Agent Carter Dubsmash war over and over, I’d likely be showing it to you on the phone. Aren’t they all the most adorable? I confess I gave up on Agents of Shield but I love Agent Carter and am looking forward to its return! I’d also recommend the wonderful Sweet & Southern cookbook, which I got for my birthday and have been dipping into regularly over the last month to make Darrell’s work treats. O & I are perusing its pages this morning to choose this week’s treat! 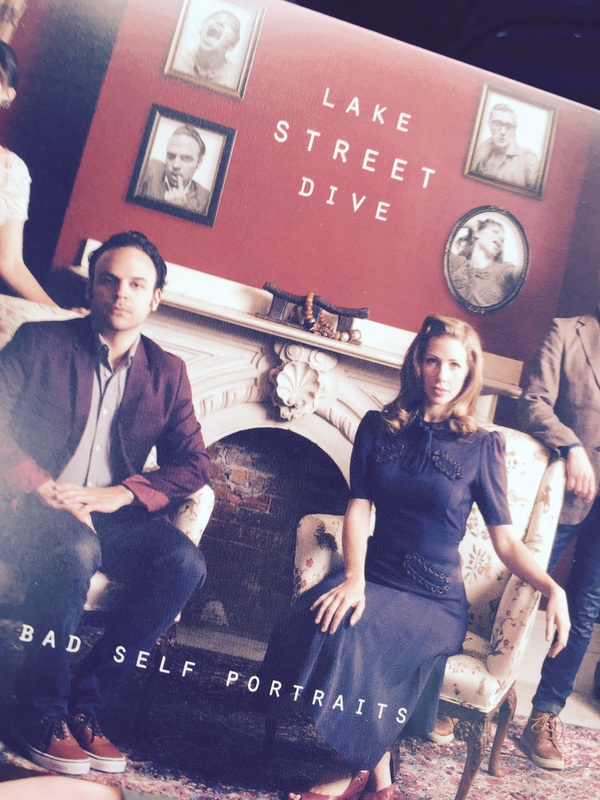 I’d also be recommending this band, which I discovered via an appearance on some NPR podcast and am LOVING! Because we’re at Village Inn and I just got caught doing this in the Village Inn bathroom, I have to tell you one of my favorite ways to sneak in fitness: Doing wall sits on the stall door while I wait for O to finish in the bathroom. He wants me standing right outside the stall door, not in with him because “I can do it myself Mama.” I’ve decided this is a great opportunity to put my legs to work! I got a very odd look from one of the waitresses who came in this morning while we were in here. Here’s hoping everyone has a lovely Saturday! Because it’s officially August (how did that happen already!) I’m sure we’d be chatting about back to school time and dealing with hot weather and who knows what else. What’s on your mind today? Thanks as always to Lynda, Coco and Deborah for hosting our little link up! Be sure to go check out what everyone else is up to this morning! 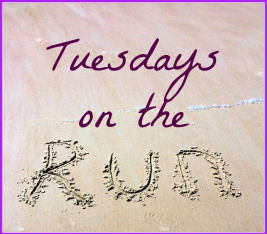 Today’s Tuesdays on the Run topic is Core Strength and Running, which is coming at a perfect time for me as I find my training ramping up (speed work and tempo runs next week). 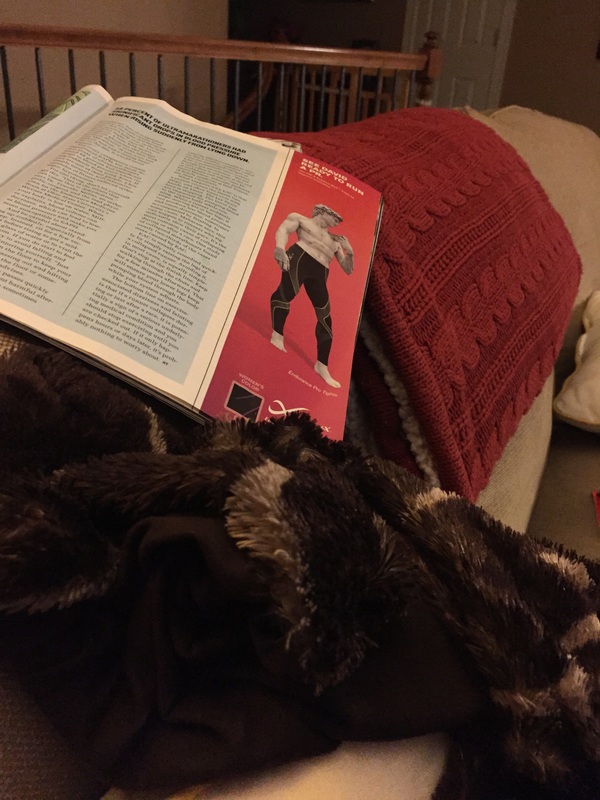 I know how important it is to keep regular strength training as part of a running plan and yet still, I put it off or forget about it even though it can be easy to work in. Core work is the one thing I’m pretty regular about because I definitely notice a difference in how I feel with my non-running life when I keep up with planking more so than with all of the other strength training I know I should be doing. Thanks as always to April, Patty and Erika for hosting! Core strength is important for daily life as much as it is for running, in terms of improving balance (key for long injury free life! ), avoiding/minimizing back pain and improving stability with movement. Those issues are especially important with running. Your mechanics are a lot more efficient when the center of your mass is stable, right? I even remember reading somewhere that adding core strength makes you faster and who wouldn’t like that? Sadly, I don’t think core work is necessarily going to be the complete solution to having abs of steel thanks the layers of fluff and loose skin we tend to carry over those stellar muscles so I tend to focus more on the FUNCTION I’m gaining with core work than any cosmetic benefit. I have a feeling I’m going to look a little pregnant for the rest of my life. First, a caveat: I’m not a trainer or sports medicine professional of any kind so these are just the things I like. Always get advice from an actual professional! Planks are definitely my go-to core exercise because they hit so many different muscle groups (abs, back, arms) and because I can fit them in anywhere/anytime. Here’s a link to the basic plank if you aren’t familiar with them (sorry I have no personal pics!). It’s important to think about your form and be sure you’ve got everything aligned – holding it longer in a bad position won’t do any good! My personal planking best is 2 minutes. I’m thinking of re-instituting a plank every day goal to see if I can beat that. I have a couple of plank variations I like as well, that I was introduced to by my trainer back in the day when I had one. They up the ante in terms of arm and shoulder strength and as a busy mom, anything that allows to work out multiple muscle groups (core and upper body) is one move is a huge bonus. Check out plank up and downs here (plank on forearms up to full arm and back) and plank with shoulder taps here (that’s a good starter list of body weight exercises in general). What’s really cool to me is remembering that I literally COULD NOT do these when I first started with the trainer back in late 2012/early 2013, but got stronger and got the hang of them. Even better, I still can do them even though I’m definitely not as diligent with my strength training these days. I still remember Darrell laughing at me as I attempted to demonstrate the up and downs in his office while telling him how evil and crazy my trainer was for thinking a human being could do this. Darrell, of course, could do them easily. Darn testosterone. Definitely check out the Tuesday on the Run link up today for more workouts and more info about the importance of core work with running! I cannot believe how fast he’s growing up. 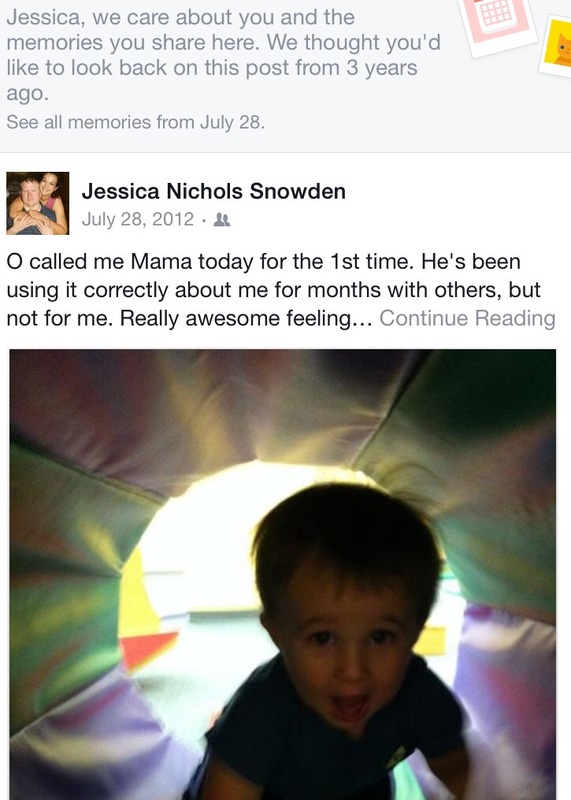 I vividly remember this Gymboree playdate and it seems like only yesterday. Instead, I now have a big kid who proudly spelled both Oliver and Jessica for me in the car today (he’s learning to spell my name because he likes me – swoon!) 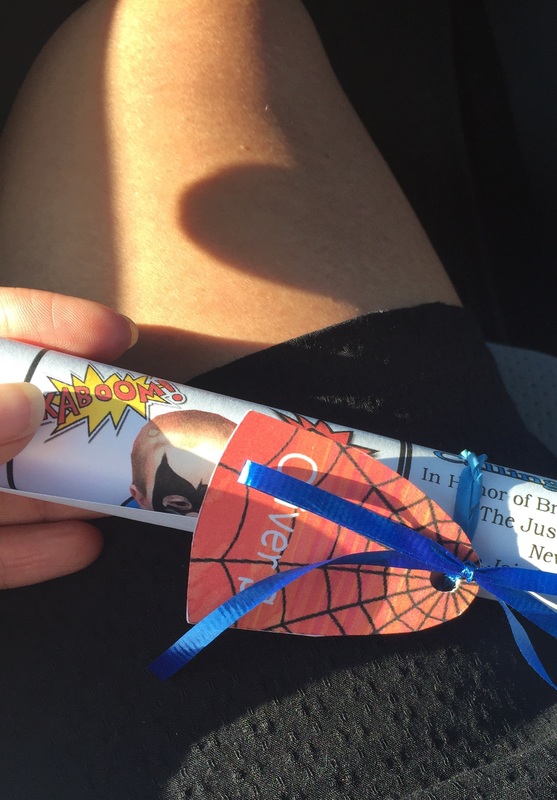 and who has a pre-K graduation already on my calendar. On the one hand, I want to go back and relive my smooshy baby over and over and on the other, I can’t wait to see what he grows up to be. All the feels this morning, seriously. What’s your favorite non-crunch core workout (I hate crunches!)? Be sure to share and to check out the Tuesdays on the Run link up for more ideas for core strength. Obviously, you should respect other people’s personal space and we’ve talked about not touching other people in ways that might make them uncomfortable. In his defense, I should point out he has stopped since I explained it that way and he has thankfully NEVER done this to anyone else. What gives me pause is how long it took me to come up with a good answer to this particular “why?” My honest answer is that it makes me feel uncomfortable because I’m self-conscious about my belly. It hangs out there as a reminder of my failures, at least in my mind, and yet I have this little voice in my head that reminds me that I absolutely CANNOT say that to Oliver because I want him to have a healthy self-image and relationship with his body. If I’m not willing to say that kind of thing out loud for him to hear, why am I saying it in my own head? 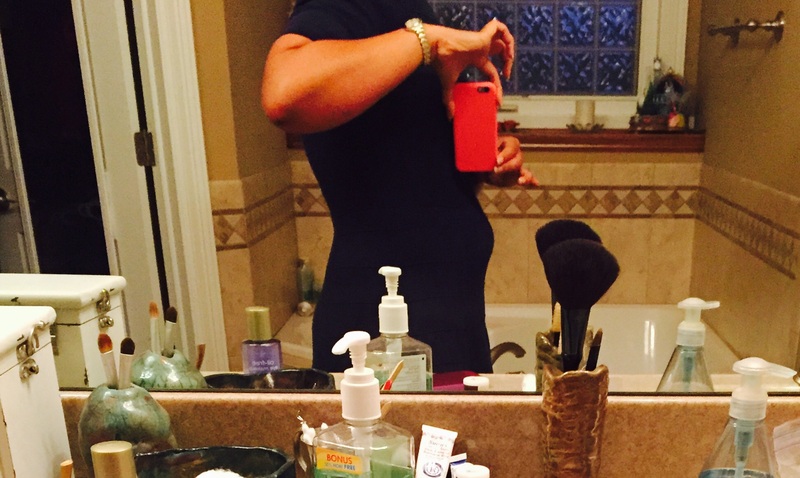 This bump doesn’t make me a lesser mom, a worse wife or less effective in my job. It doesn’t make me a bad person. It’s occasionally annoying when I run but it hasn’t kept me from running 5 half marathons in the last 18 months (HOLY COW – Is that right?). 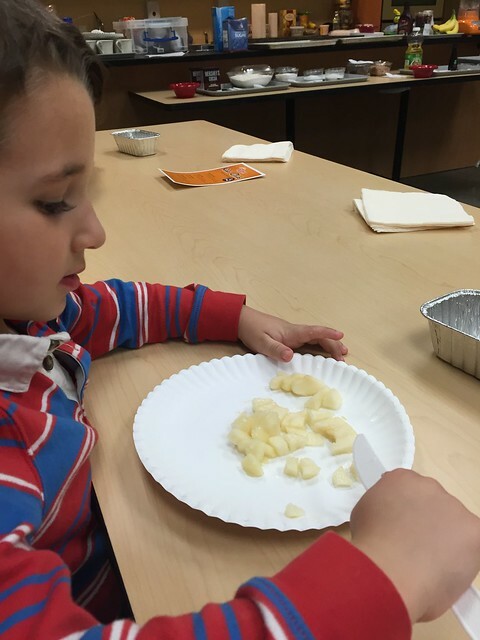 We had our first cooking lesson this week: Scrambled eggs. He’ll tell you that eggs have protein for your muscles so you can run and play. I talk a lot about what a motivation Oliver is in my food choices and in my exercise. Maybe it’s time I start using him as a motivation for upping my mental game as well. When I find myself in those negative mind spaces, I have to ask myself if I’d ever want him to hear me talking out loud like that. Whether we say those things out loud or not, kids pick up on it and for his sake and mine I need to come to peace with my belly. Anybody have any other tips for short circuiting negative self talk?